Humane Urban Wildlife Management: What Does it Really Mean? Humane wildlife management requires never destroying a healthy animal and partnering with local wildlife rehabilitation centers and humane societies so that injured wildlife or orphaned animals are handled by experts. Here are two companies in Canada that are making it happen. I must confess that I am not an "expert" in wildlife management; however, I have been involved in pest management since 1979 with the usual focus on major insect pests, rodents and typical urban small mammals and birds, mostly pigeons. Historical Perspective. I remember when I worked for a national pest control firm (in Canada), and the usual wildlife call resulted in a staffperson with the most rudimentary training driving to the customer's home with a live trap for raccoons, squirrels or skunks and returning when the client called to advise something had been caught. Then, the firm relocated the caught animal at some distance from the client's home. There was no attention to the possibility of young animals left behind, except to respond to complaints of the odor of death decay. Pigeon control often involved use of Avitrol with the claim "it doesn't hurt them, but scares them away," or trapping programs that included destroying the caught birds. I was once on a major control job using strychnine bait and I will only say now that it was very unpleasant work. At that time, it was still permitted to treat bat infestations with DDT — "dust the attic" was the instruction. Wildlife management was not the main focus of my job and was a fairly small portion of the work the company did, but I did get the University of Nebraska guide — a leading publication in wildlife control as a resource. The killing of unprotected wildlife was a common recommendation in the guide, especially when wildlife threatened farm animals or crops. It seemed to make a lot of sense. We've learned a lot since then. The regulation of wildlife management has improved and includes restrictions on relocating and destroying wildlife, but trapping programs still recommend destroying caught pigeons, even though this can mean the death by starvation of nestlings. And the results of such programs are temporary if the conditions that attract the birds — such as feeding on site or unattended balconies — are not addressed. It is also well known that squirrels or raccoons relocated outside their home range will likely die. I appreciated his honesty and forthrightness about his warranty. Over more than 20 years, there was never a single warranty dispute with AAA — only a professional response with appropriate actions and sound assessments of the specific cases. Gates began a new way of approaching wildlife management in urban areas, and his approach has resulted in more firms doing this work with his philosophy. This approach was so outstanding that his firm (now Gates' AAA Wildlife Control) has been featured in the media in Canada and the United States many times, most notably in the National Geographic 13-part series "Animal Extractors." Gates has had no shortage of work. Many large urban centers take pride in greenspace within city boundaries. And as surrounding former farmland or wooded areas continue to be developed, wildlife populations become a more visible part of the entire human-dominated landscape. New populations of adaptable wildlife have become well established within cities. Some cities in North America have coyote populations that have become accustomed to traveling in green-space corridors and sometimes take pets as food prey, though rodents are the mainstay of their diet. The management of coyotes without killing them is a new challenge in the urban wildlife management arena. 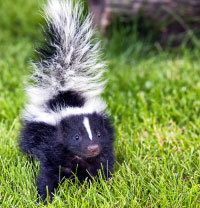 The issues caused by more common urban wildlife often considered nuisance animals are well known; of course, when a squirrel or raccoon or skunk family has taken up residence in a home, it is a threat to the homeowner's sensibilities, to the home and can also pose human health risks. Wildlife is the basic focus of the business or division. Staff is specially trained in this work, including detailed wildlife biology and hands-on removal and exclusion techniques. Compliant with all appropriate health and safety and wildlife regulations. Trapping is not an acceptable practice. Killing healthy wildlife or relocating wildlife is not an acceptable practice. Warranty/guarantee of workmanship is well defined (no small-print/escape clauses). Humane Societies or wildlife rehabilitators are never charged for cooperative actions such as transport of animals. Euthanasia of injured or sick wildlife shall only be performed by qualified wildlife rehabilitators or veterinarian staff. Focus on customer service/satisfaction and true humane care of wildlife as part of Integrated Humane Urban Wildlife Management processes. For some, the well being of the wildlife may be irrelevant compared to their desire to be rid of the threat; however many people, given the option, would prefer to solve the problem without harm to the animals. There is a pleasure in sharing their city with wildlife, and the respect they extend to robins, blue jays, cardinals or even raptors or pigeons can even include, in the proper setting, squirrels and raccoons. This includes assessment of the problem, identification of the wildlife, knowledge of the biology of the particular species with relevancy to particular issues (e.g., bat exclusion only after young are able to fly). Humane wildlife management is not merely the use of the adjective "humane" but requires never destroying a healthy animal and partnering with local wildlife rehabilitation centers and humane societies so that injured wildlife or orphaned animals are handled by experts. Unlike in the past, the work includes proofing and repairs as well as specific recommendations for future humane exclusion. Humane wildlife management firms also train staff extensively. Skedaddle Humane Wildlife Control purchased a house to use for this purpose. Staff and franchisee owners undergo a full month of training that includes hands-on work in attic removal, fall protection training and various screening exclusion techniques and repair work, before ever going into the field. Gates' firm also trains individuals who wish to enter the field. Franchising in other area locales outside of their home market is also a part of the business model of these organizations. What it all Means. Humane wildlife management/removal does not include relocation as the key is to solve the problem at its source. Without steps toward future prevention, the problem will recur when other wildlife takes over the territory of the relocated animals. Brad Gates expresses the commitment to humane wildlife management very clearly: "We are guided by the firm principle that animals deserve to be treated with compassion and that society needs to learn to live in harmony with wildlife." These firms are so confident in their work that they offer well defined warranties. Both post their recommended standard to gain business but also to protect consumers from fly-by-night operations that do not state clearly what will be done, including what happens to the animals. Finally, as with IPM involving common pests, education is key. A series of handsome booklets about Toronto wildlife has recently been published and is available to the public at no charge; this includes information about mammals, spiders, birds and reptiles/amphibians. In addition, specific information on humane resolution of conflicts with wildlife is available online, and the wildlife rehabilitation center in Toronto recommends only humane wildlife management firms when contacted by the public or by property/facility managers or other organizations. Toronto is certainly not the only city that has organizations that encourage this practice and handles calls from the public with referrals to ensure wildlife is humanely managed. Pest management firms that want the benefit of offering wildlife management services to their clients as well as large and small specialty wildlife control firms that do not currently practice true Integrated Humane Wildlife Management would be well advised to embrace this model. It is clearly "the right thing to do" from both an ethical and a business practice ideal. Speaking to Brad Gates and Bill Dowd as well as to their staffs, I can hear satisfaction not only in doing a good job and running a profitable growing business, but also from treating wildlife with care and humanity every day. Author's note: Thanks to Nancy Lawson, vice president, publications and brand management of the Humane Society of the United States, for her editorial contributions. Sam Bryks, M.Sc. B.C.E,. of Integrated Pest Management Consultancy, is an independent consultant and has been in the pest management field for more than 30 years.